Create with Gwen: Creative Weekend with the Kiddies! Creative Weekend with the Kiddies! I spent a few days with my grandchildren while my daughter and her hubby got to enjoy some time to celebrate their anniversary and attend a friends wedding. In between the super heroes, playing board games, pretending they were bear hunters, and setting up race tracks, they had a blast making Mommy and Daddy anniversary cards! They even made their own stamps! 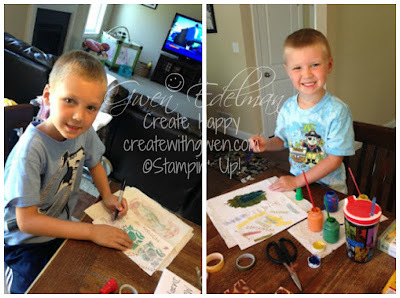 Using the scrap rubber from Stampin' Up! wood-mount stamp sets and some scrap wood pieces from Pop-pop, we cut up the rubber and they arranged the pieces on the wood! Made my heart happy to see them, ages 4 and 6, enjoying creativity and making cards! The boys were so proud of their creations! Baby Elyse just watched, but she'll have her time playing with my Stampin' Up! goodies before you know it! Got a bit messy, but sure had fun! Happy Anniversary Mommy and Daddy! Want a hard copy of the New Holiday and Annual Catalog, If you do not have a relationship with a demonstrator, contact me and I'll send you one!